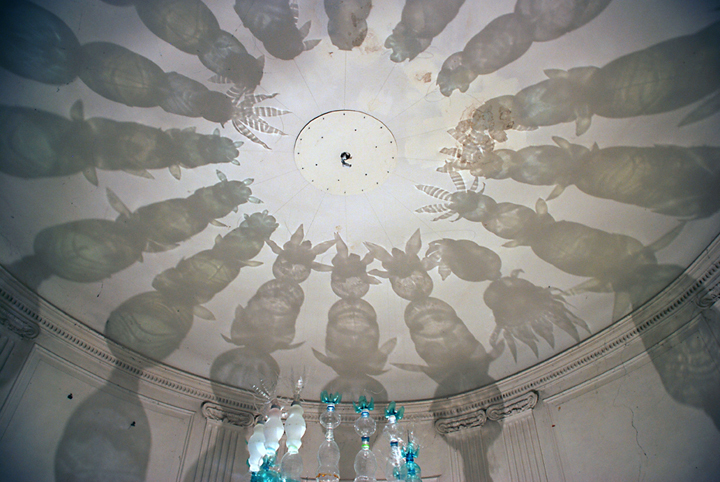 The project #Säulenhain started in 2007 during a stay at an Artist in Residency at Schloss Ringenberg in Hamminkeln, Germany, where I got fascinated by an obsure tower room with its neo-classicistic ornaments. While re-adjusting to German lifestyle and language (at that point I had been living in the Netherlands for the last 10 years) I discovered the implications of architecture and identity politics. The Illuminating Shadows of the formation of a German Nation state. In the 19th century the owner of the castle Ringenberg built a new room in the particular architectural style of NeoClassicism, the only one in that style in the whole castle. But this same room became isolated from the other rooms: There is no direct and convenient official entrance to that room anymore. Under the community of artists in residencies and the villager in Hamminkeln too this room got mystified, got called 'the Hidden Room'. What does this implicate for our current situation? Can we find tether the hidden chambers of German Nationalism? Could we invent another Myth about German Identity too, please? Short scenario of the script of the video „Säulenhain“: Säulenhain is simulating nature, constructed by objects of transparent, artificial materials and animated by the most simple technical devices, the shadow-play. The arranged objects, taken from everyday life, are combined with a subtle choreography of reflections of light and shadow. An optical landscape is created, in which the range between illusion and the world of material objects, between nature and culture is explored.